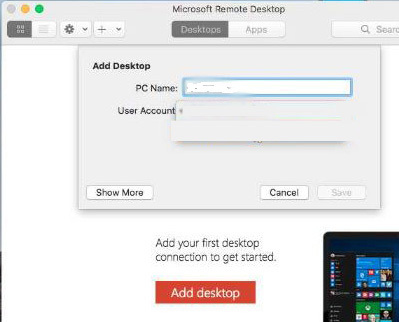 First-time setup of the Remote Desktop Connection on a MAC. 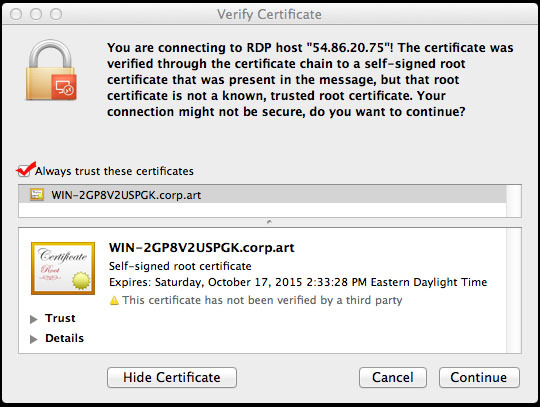 NOTE: There are two user IDs and two passwords involved. 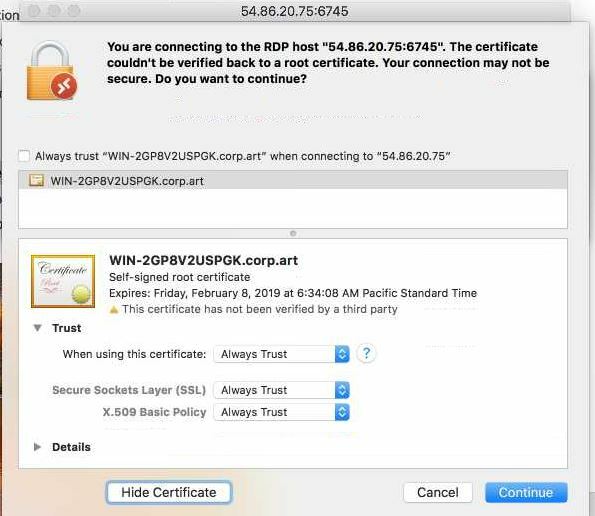 (1) The user ID or PC name for connecting to the server is 54.86.20.75:xxxx. The password is a word followed by a hyphen and a digit. 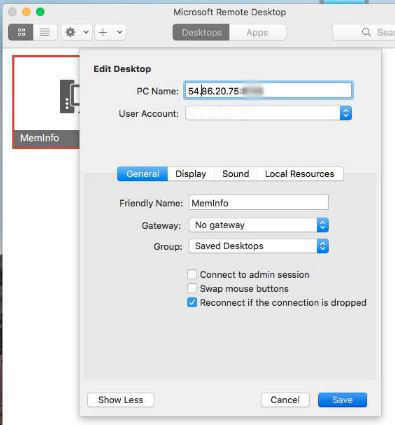 (2) The user ID for MemInfo, itself, is assigned by your master user. It will consist of an abbreviation of your church name (which tech support will give you) followed by your name or role. The first time you log on, it will ask for your ID and password; leave the password blank, and then it will ask you to create one. 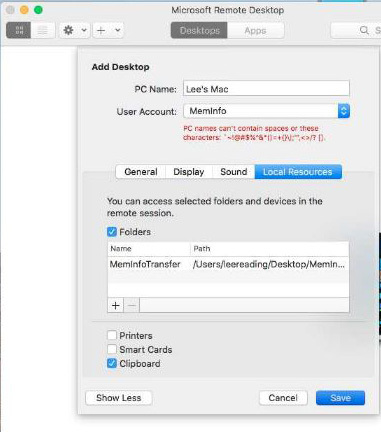 Step 1: Create a folder on your desktop named “MemInfoTransfer” (no spaces!). You don’t need to put anything into it, just create it. Click the “Get” button that is below the red icon. 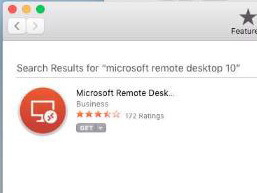 (a) Double-click that “Microsoft Remote Desktop” icon. 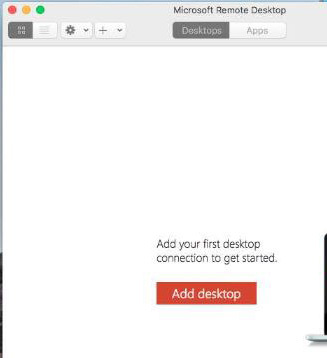 (c) Click the “Show More” button in the lower left-hand corner. (e) Click on the “Local Resources” tab. Check “Clipboard” at the bottom. Do not check “Printers” or “Smart Cards”. 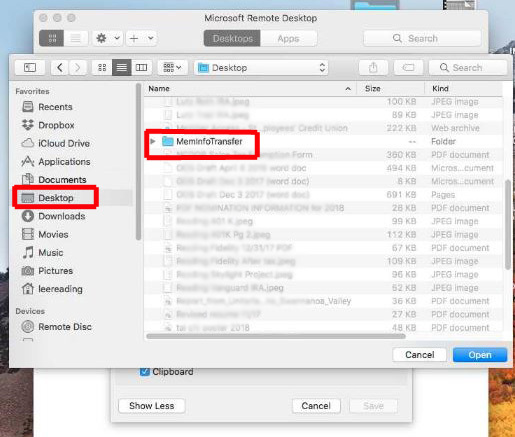 Check “Folders” then click the “+” to indicate your MemInfoTransfer folder on your desktop. (f) click the Save button. It will ask for your password. This is the password that you were given for the xxxxxx-x number. 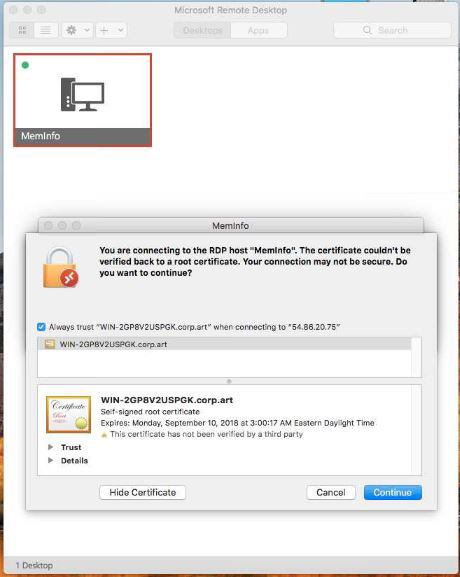 It’s not your MemInfo user ID. 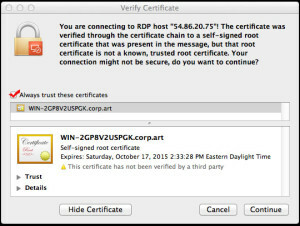 If you see this screen, you should click to say that you trust it. If you see this screen, then enter the corp\xxxxxx-x ID and password. Then you won’t have to go through these screens again. 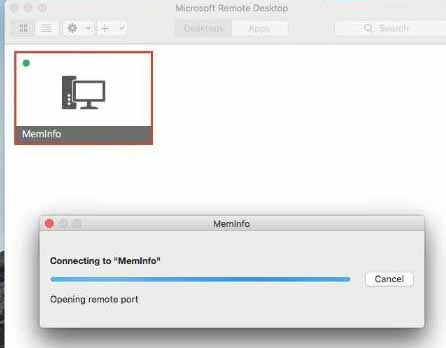 When you logoff from the MemInfo Server, it might take between 5 and 20 seconds before your own desktop will appear. You’ll need to wait.